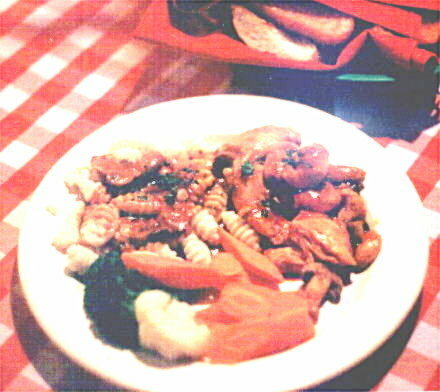 (Sept. 10, 2002) -- The Justice Dept. 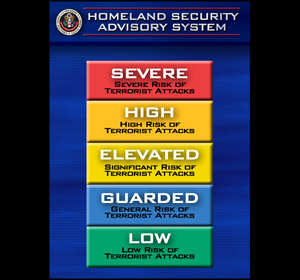 and White House Office of Homeland Security announced today that the nation's terrorist threat level has been raised to "High" (orange level, details on what this means below) from its previous "Elevated" (yellow) level. The development was first announced at the White House daily press briefing and followed 90 minutes later by a Justice Dept. news conference with U.S. Attorney General John Ashcroft and Homeland Security Director Tom Ridge. We provide extended transcript excerpts (unofficial, prepared by us) below. The High threat level is only one step below the highest terrorist threat level, "Severe" (red). The nation has been on Elevated risk since the system was implemented in March, 2002. "The U.S. intelligence community has received information based on debriefings of a senior Al Qaeda operative, of possible terrorist attacks timed to coincide with the anniversary of the Sept. 11 attacks on the United States. Information indicates that Al Qaeda cells have been established in several south asian countries in order to conduct car bomb and other attacks on U.S. facilities...The U.S. intelligence community has also received information that one or more individuals in the middle east are preparing for a suicide attack or attacks against U.S. interests. At this time, we have no specific information as to where these attacks might occur. The U.S. intelligence community has concluded that the most likely targets of Al Qaeda attacks are the transportation and energy sectors and the facilities or gatherings that would be recognized worldwide as symbols of American power or security. Examples of such symbols are U.S. military facilities, U.S. embassies and national monuments. In addition, U.S. intelligence has concluded that lower level Al Qaeda operatives may view the Sept. 11 anniversary as a suitable time to lash out, in even small strikes, to demonstrate their worldwide presence and resolve. Accordingly, widely dispersed unsophisticated strikes are possible as well. ...Last year at this time, United States intelligence discerned similar patterns of terrorist threat reporting overseas. In addition, other recent events parallel terrorist activity that occurred in the weeks prior to last year's attacks. I want to emphasize that the recommendation made today was not made to move to the level of alert, an action that would have been triggered by specific, credible intelligence and analysis pointing toward an imminent attack on the United States homeland. At this time, most intelligence focuses on possible attacks on U.S. interests overseas. ...As we have been forced to do in the past, today we once again call on the American people to remain alert but defiant in the face of this new threat. We are not -- we are not -- recommending that events be cancelled, nor do we recommend that individuals change domestic travel plans or that the federal workforce not report for duty. We are not making those recommendations. We ask that Americans, both at home and abroad, mark the anniversary of last year's savage attacks with a heightened awareness of their environment and the activities occurring around them. This call, which Americans have heard before, is based on specific intelligence that heightened awareness and readiness deters terrorism. Each of us has the ability to increase the security that we need, security for ourselves, security for our families and security for our communities. Today we call on Americans to exercise this responsibility with special care and vigilance. At the same time we are taking these actions at the federal level, Governors, Mayors, state and local enforcement as well as private sector managers of the nation's critical infrastructure will be taking action as well. For individual Americans, for every citizen we know this is a very sobering announcement. Just as federal, state and local officials are taking precautions, we certainly recommend and think there are some common sense measures that would enhance their security and some common sense precautionary things they should do as well...We've called on them before, but the Attorney General, the FBI Director and I have see on a fairly regular what happens with citizen involvement when they are extra vigilant and extra careful, when they become very alert to suspicious activity. We call on them to maintain that high level of awareness...Let's make sure that every individual citizen who sees something suspicious reports it...to their local law enforcement. ...Because of the specific information that we have, very consistent with the pattern of intelligence activity that was detected prior to 9-11, that the recommendation was made to raise the level of alert. I might add that we don't think America needs to be reminded that we are at war. However this announcement is a reminder that there are people around the world who would do us harm, and our response is to continue to be America, but to be alert, to be vigilant. We'll persevere through this. We'll persevere now and ultimately we will prevail. Q: Is there any intelligence to suggest that any attacks are planned domestically or is the concern primarily overseas? Attorney General Ashcroft: I would say that the most recent intelligence which has prompted us to issue this change in our status has focused primarily overseas and frankly, part of the analysis of that is that that's very similar to the circumstances that existed a year ago. Factors for assignment of Threat Conditions. Unified system for public announcements. Public announcements of threat advisories and alerts help deter terrorist activity, notify law enforcement and State and local government officials of threats, inform the public about government preparations, and provide them with the information necessary to respond to the threat. State and local officials will be informed in advance of national threat advisories when possible. The Attorney General will develop a system for conveying relevant information to Federal, State, and local officials, and the private sector expeditiously. Heightened Threat Conditions can be declared for the entire nation, or for a specific geographic area, functional or industrial sector. Changes in assigned Threat Conditions will be made when necessary.